Most of the best restaurants in Dubai are located in the hotels, and Fire & Ice is no exception. A sophisticated grill situated in the Raffles Hotel, Dubai, its dark, earthy colours and brickwork décor gives the restaurant the look and feel of a big hitting New York steakhouse. Flickering flames guard the open kitchen and this adds to the sense of the restaurant’s drama. Raffles Hotel predominantly caters to a corporate clientele so the design of the restaurant suits its customers well. Fire & Ice specialises in a variety of quality cuts of meat prepared to your liking, although there is also a reasonable range of seafood choices. Being part of the family that includes the famous Raffles Singapore, it would be remiss to not begin the meal with a Singapore Sling, or in this case, a Dubai Sling (AED70 – about £12), a delicious mix of Plymouth gin, coriander, chilli gomme, fig preserve, lemon soda and angostura bitters. Fire & Ice also has an extensive list of 700 wines, and was awarded the Wine Spectator’s 2013 Award of Excellence. 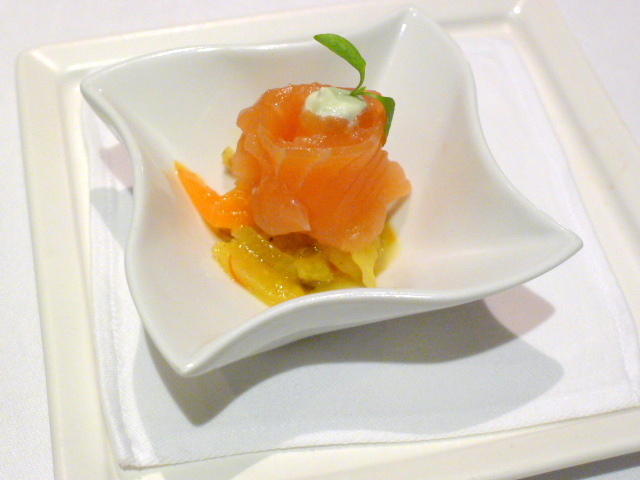 Our meal started with an amuse bouche of cured salmon perched on top of some pickles and bell peppers that had been fragranced with saffron and coriander seeds. It was delicious from the superb spicing, and the salmon was sweet and delicate. 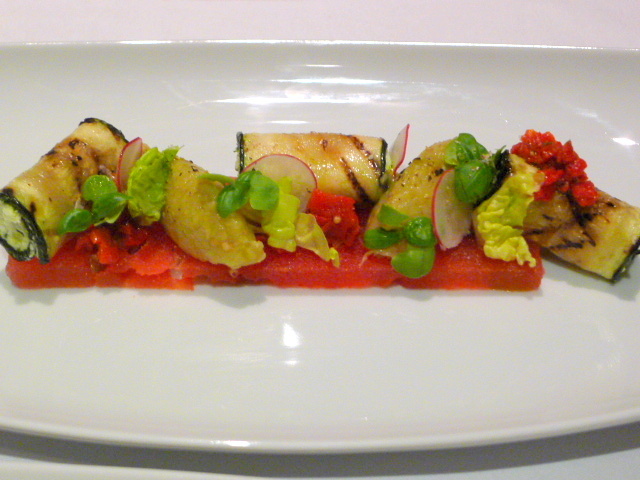 A vegetarian starter of marinated feta with smoky aubergine caviar, watermelon and piquillo peppers (AED75 – about £12.80) was excellent. The contrast in flavours between the salty feta, the smoky, earthy tones of the aubergine, the sweetness of the peppers and the refreshing watermelon was delectable. For the finishing touch, aromatic basil had been used to elevate the final product. 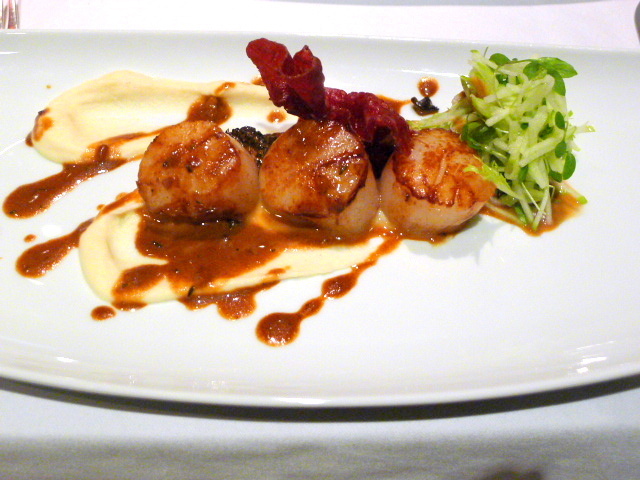 Some lovely seared Scottish diver scallops (AED95 – about £16) were accompanied by a celeriac purée and a garnish of apple with herbs, both of which were tasty on their own. A sauce of warm morels with aged balsamic vinegar dressed the plate, and although nicely done, proved heavy against the delicate flavour of the scallops. A third starter of poached and diced Canadian lobster with mango, avocado and basil (AED95 – about £16) was fresh with a good balance of flavours, if a little bit cold. The sweetness of the mango was a wonderful addition to the dish although I would have liked a touch more basil for greater aroma. There was an impressive long list of various cuts of meat from French grass fred charolais to Irish grass fed Angus to a variety of wagyu cuts. 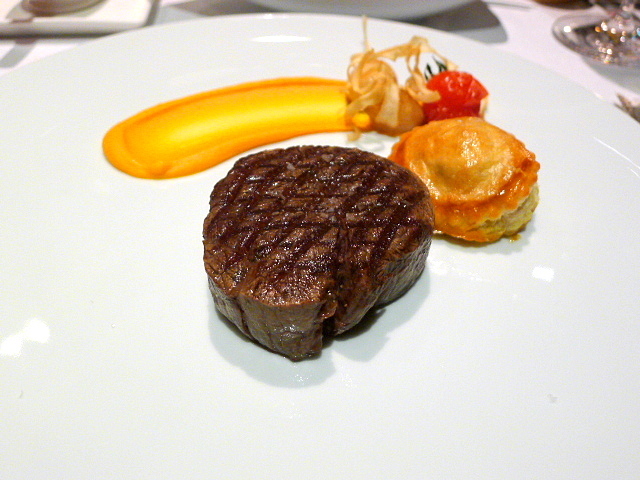 An Australian wagyu tenderloin with a marbling score of 8+ (100g, AED270 – about £46) was cooked to a perfect medium rare and was beautifully tender, succulent and fully of flavour. But although the meat was supremely tasty and highly enjoyable, it surprisingly didn’t deliver the fatty marbling flavour that I was expecting from a wagyu cut with a score of 8+. 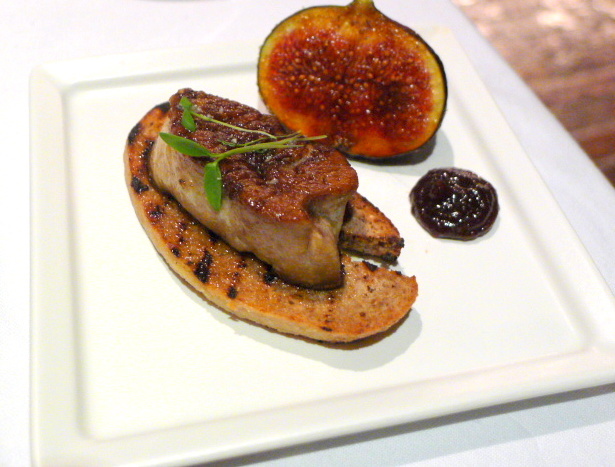 A side order of foie gras (AED70 – about £12) served on brioche and with a fig chutney, was disappointingly rubbery and lacked for flavour. But a veggie side of creamed spinach (AED30 – about £5) was well-seasoned and creamily decadent. 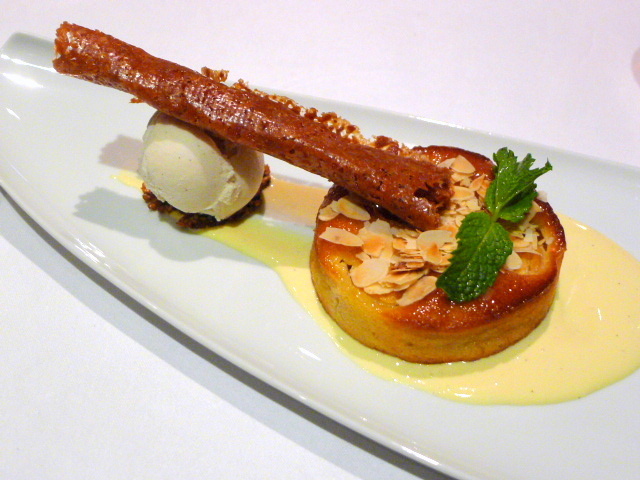 To desserts, and an apricot and orange blossom clafoutis (AED30 – about £5) served with Tahitian vanilla ice cream was melt-in-the-mouth moist and tasty. But although it was yummy, it was light on the expected apricot and orange blossom flavour. 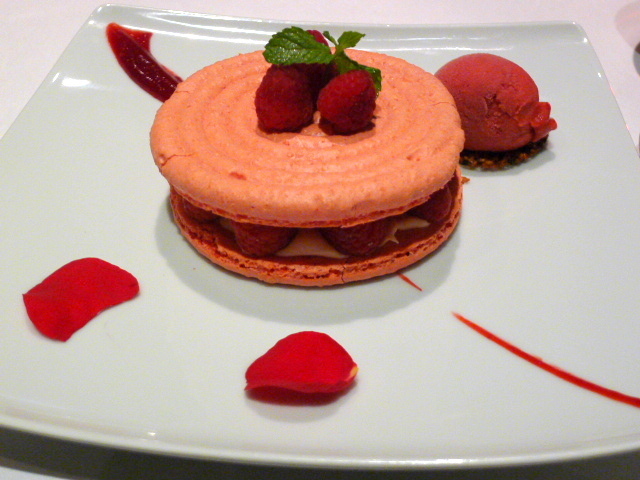 A rose and lychee macaroon (AED30 – about £5) was massive. It’s hard to tell from the photo but it probably measured about 12cm in diameter, and surprisingly there was a decent bake on it given its size. It wasn’t entirely gooey and soft throughout its core, but soft enough. I found it a touch too sweet, but the use of rose and lychee was a nice flavour combination and the accompanying raspberry sorbet was zingy and delightful. Fire & Ice is a powerhouse of a restaurant. It’s great to look at, comfortable to sit in, offers excellent service, and comes with a menu that glistens with choice and dependable, solid cooking. Ignoring the miss on the foie gras, there’s no doubt that the quality of the ingredients are top-notch. Prices: AED245 to AED740 (about £42 to £126) for three courses, excludes drinks but includes taxes and service.